For many individuals, it's a common dilemma - You wake up in the middle of the night to head to the bathroom, but you're forced to find your way through dark hallways and grasping for the light switch once you actually make it to the washroom. Worse yet, when those lights go on, and your eyes aren't adjusted, it can be a pretty uncomfortable experience. 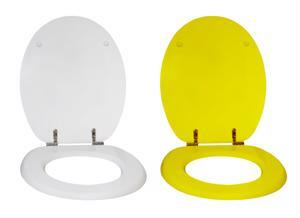 According to CBS News, inventor Dave Reynolds and his partner Tim Fittler have unveiled the glow in the dark toilet seat. The two hope that their product can make people a bit safer each evening and could shoot to the top of the shopping list for many homeowners in search of bathroom accessories. Reynolds told the news source that he experienced a mishap while using the bathroom at night and actually slid off the toilet seat in his darkened bathroom. After shaking off the bangs and bruises, it occurred to him that a glow in the dark toilet seat could be a fabulous safety investment for children, the elderly and anyone else who happens to be a bit clumsy! Their product, dubbed Night Glow Seats, retail at $49.99 and are available in either blue or green. "It's a great product, and hey, does it really hurt you if it glows? Do you really want your grandma to fall down because the lighting wasn't right? Or for a little kid, who is just learning to get up in the middle of the night to go to bathroom on their own?" Reynolds told the news source. "It's a bathroom lighthouse at the end of the day." According to DigitalJournal.com, the partners worked with Scott O'Neil, director of applied research and development at St Clair College. Along with a team of enthusiastic college students, the team worked to engineer a toilet seat that can glow for an extended period of time, provide a series of colors and can be installed easily over existing devices. Not only was this a great learning experience for the students to see the launch of a consumer product from the drawing board to store shelves, but they have also implemented a series of target market analysis and marketing strategies. In the end, bathrooms all over the country may have gotten a whole lot safer, and cooler!